A-HOTEL.com - Lacné ubytovanie Vitré. Lacné hotely, nízke ceny, hotely so zľavou. Lacné Vitré ubytovanie. Väčšinu ponuky tvorí lacne 2 a 3 hviezdičkové hotely či apartmány za nižšie ceny. Lacne Vitré ubytovanie v tomto prípade ale vôbec nemusí byť zároveň aj zlé. Pre istotu si skontrolujte celkové hodnotenie od klientov a v pokoji si zarezervujte komfortnú izbu v hoteli za nízku cenu. Často aj tieto lacné Vitré hotely ponúkajú veľmi zaujímavú zľavu na poslednú chvíľu a potom je cena ubytovania naozaj "za babku". Situated in Vitré city centre, this hotel offers free Wi-Fi in the entire property, free newspapers and free luggage storage. Providing private parking, Le Minotel is a 40-minute drive from Rennes. Located in Vitré, Hotel Restaurant La Grenouillère features non-smoking guest rooms, a bar and a restaurant, 41 km from Rennes. Free Wi-Fi and free private parking are provided on site. The hotel Citôtel Le Petit Billot is ideally located in the historical town centre of Vitré. Vitré, gateway to Brittany, is a treasure of medieval architecture. This hotel is situated next to the medieval castle in the centre of Vitré, just 300 metres from the train station. Guests are invited to use the free Wi-Fi internet. Located in Vitré, just a 10-minute walk from the Train Station and the city centre, ibis Vitré Centre offers a 24-hour reception, a terrace and luggage storage. A lift is also available. 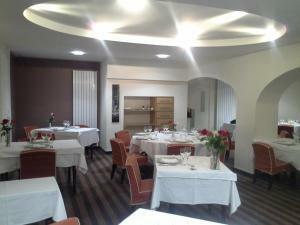 Located in Argentré-du-Plessis, Hotel Restaurant Le Cheval Blanc offers 2-star accommodation with a bar. All rooms feature a flat-screen TV with satellite channels and a private bathroom. Offering free access to the hot tub and fitness room, hotel Le Privilège is located in the Breton countryside, 5 km outside Châteaubourg. The contemporary guest rooms all offer a garden view. Located 25 km from Rennes and set in a large park, Hotel le Bretagne offers a traditional restaurant, a bar and a terrace. The rooms include a flat-screen TV with cable channels. Ar Milin' is located in Brittany on a five-hectare park, home to the Vilaine River. It offers rooms in a main building and an annex some with a view of the park and river. Located in Domagné, Le Ricordeau offers a garden, terrace and on-site restaurant. Châteaubourg is a 5-minute drive away and Rennes is a 25-minute drive away from the property. Hotel les forges provides accommodation in Noyal-sur-Vilaine. This 2-star hotel offers free WiFi. Located in the heart of the medieval city of Châteaugrinon, near Rennes, the Auberge du Cheval Blanc welcomes you in a warm and friendly atmosphere for an authentic stay. The hotel has 12 very comfortable rooms. This Campanile hotel is located on the N12 motorway, outside the city centre of Fougeres in Brittany. It offers a terrace and accommodation with free Wi-Fi access. The Brit Hotel du Parc is located 2km central Fougères. It offers free Wi-Fi internet and each guest room has a private bathroom and flat-screen TV with satellite channels. This hotel is located in Fougères, right in the heart of the ancient citadel of Duché de Bretagne. The hotel offers free Wi-Fi internet access and a mixture of traditional stone walls and modern décor. With a 24-hour front desk, ibis Rennes Cesson is 3 km from Cesson-Sévigné and 7 km from Rennes. All rooms are serviced by a lift and feature free Wi-Fi, a flat-screen TV and a private bathroom. Le Clos Champel is located near the town of Cesson Sevigne in Brittany. It is set within an old forge and offers comfortable accommodation with a pool and hot tub. Le grand cerf offers pet-friendly accommodation in Ernée. Guests can enjoy the on-site restaurant. Hotel Ibis Budget Rennes Cesson sa nachádza na okraji mesta Rennes, na výjazde z diaľnice spájajúcej Paríž s Brestom, v blízkosti centra mesta a výstaviska a 15 minút jazdy od železničnej stanice Rennes. Ponúka bezplatné parkovanie. Situated right outside the city of Rennes, off the motorway linking Paris to Rennes, this 3-star hotel provides very comfortable accommodation to offer you a pleasant stay. Brit Hotel Floreal features soundproofed rooms equipped with satellite TV, a direct telephone and free Wi-Fi internet access.